Looking to make a small but significant change in your diet this summer as you get ready for bikini season??? Then let me recommend MELT Organic's all natural butter substitutes! MELT Organic’s all-natural butter substitutes are made with fair trade virgin coconut oil and other good-for-you plant and fruit-based ingredients. Available in original Rich & Creamy and Honey varieties, MELT spreads were created for butter enthusiasts seeking a healthier alternative. Brand new additions to the product line include Buttery Sticks, specially formulated to perform just like butter when baking, and Probiotic Buttery Spread, a butter improvement that delivers active cultures more effectively than yogurt. Finally, a way to make your favorite recipes guilt-free! MELT Organic spreads are North America’s first line of luscious butter improvements that are truly good for you. Each variety of MELT Organic features the Perfect Blend of the healthiest oils. This Perfect Blend is made from natural, fruit- and plant-based organic oils: virgin coconut, palm fruit, flaxseed, sunflower and canola. Each serving of MELT Organic is a rich source of Medium Chain Fatty Acids (the “good fats“) that your body burns as energy instead of storing as fat, thereby boosting metabolism. Each square of MELT Organic spreads are truly good for you: certified organic, non-GMO (Non-GMO Project Verified), kosher pareve, and made with Fair Trade Fair for Life certified organic virgin coconut oil and Rainforest Alliance certified palm fruit oil. 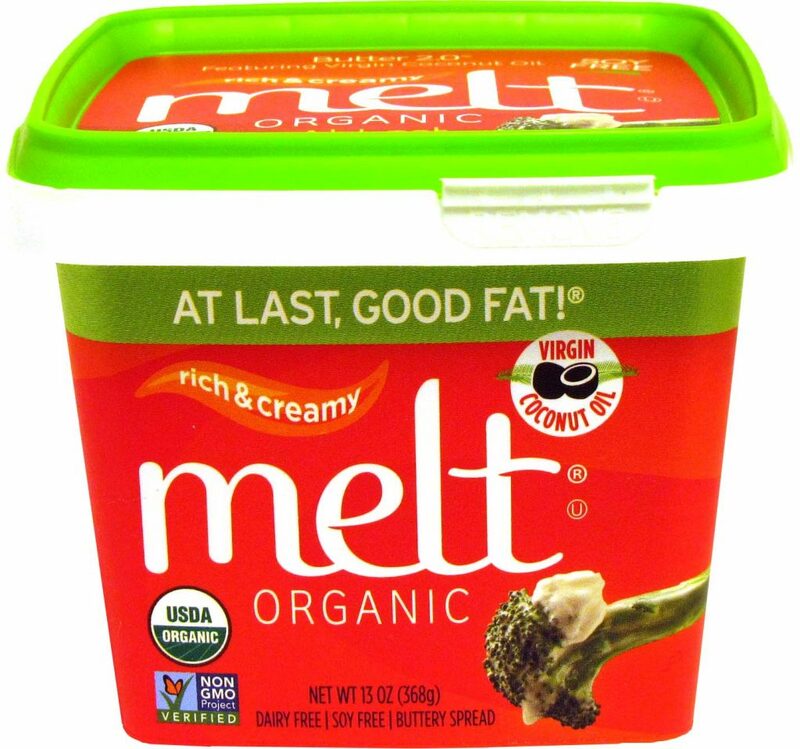 And MELT Organic spreads are also soy free, gluten free, and dairy-free. And I am excited that they recently introduced NEW MELT Organic Buttery Sticks! MELT’s NEW Buttery Sticks is made from a creamy blend of virgin coconut oil, hi-oleic sunflower oil and palm fruit oil. Unlike any other vegan or vegetable oil sticks, MELT is optimized for baking and cooking with oils that are not high in omega 6 ALA’s, like soybean, canola, safflower. Even better, MELT Organic Buttery Sticks bake and cook just like real butter but with 1/3 the saturated fat and fewer calories. Moms agree that MELT’s new buttery sticks exceed their expectations. Each stick is truly good for you and continues their commitment to source only eco-social and environmentally friendly ingredients and packaging: certified organic, non-GMO (Non-GMO Project Verified), kosher pareve, vegan and made with Fair for Life Fair Trade certified organic virgin coconut oil and Rainforest Alliance certified palm fruit oil. MELT Organic Buttery Sticks are also packaged in sustainable cartons made with wind energy. 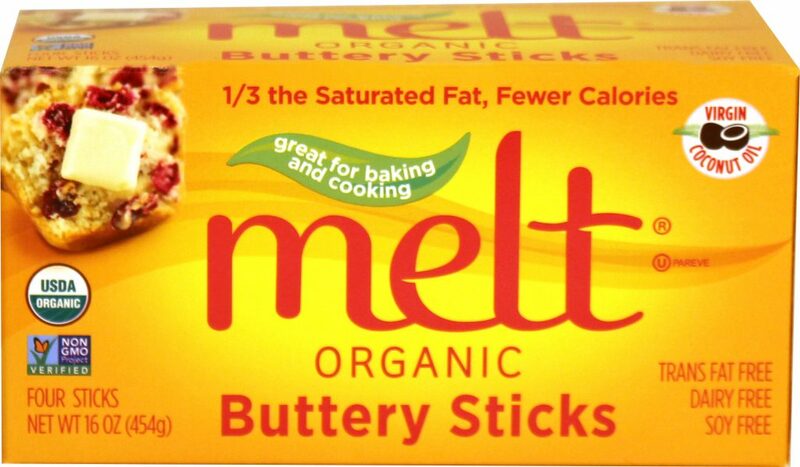 MELT Organic Buttery Sticks are also trans fat free, dairy free, gluten free and also soy free and canola free. I am so excited to use MELT Organic buttery sticks and spreads in my cooking, baking and daily butter needs! I am a huge fan of coconut oil and I am so excited to use it even more now with these products! You can purchase MELT Organic products at your local retailer. MELT Organic is generously offering 4 MELT Organics coupons to a lucky winner!